Batangas City is politically subdivided into 105 barangays. Pagkilatan was formerly a sitio of Matoco. Malalim was formerly the "southern portion of the barrio of Sirang Lupa, the northern portion of the barrio Mahabang Dahilig, and the eastern portion of San Isidro" "together with the sitio of Malalim"; this territory became a barrio (barangay) in 1954. In the same year, sitio Malitam, formerly part of barrio Libjo, was elevated as a barrio. San Antonio was constituted from the sitios of Ilaya, Labac, Matalisay, Pajo and Cacawan, from the barrio of San Agapito. In 1957, the barrio of Talumpok was divided into two. Sitios Romano, Poyesan, Bondeo and Latag were constituted into Talumpok Silangan, while sitios Ginto, Duhatan, Kulingkang, Piit and Cuaba were constituted into Talumpok Kanluran. Balagtas was formerly known as Patay, Kumintang Ilaya as Sambat Ilaya, and Kumintang Ibaba as Sambat Ibaba. Batangas City" (PDF). Department of Education - Calarbarzon. Retrieved 26 April 2016. 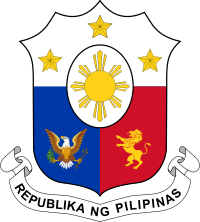 ^ "LIST OF PRIVATE SCHOOLS OPERATING WITH PERMIT/RECOGNITION REPUBLIC OF THE PHILIPPINES Department of Education Region IV-A CALABARZON BATANGAS CITY" (PDF). Department of Education - Calarbarzon. Retrieved 26 April 2016.